Bring milk to boil in a small saucepan and heat until scalded. Add butter and sugar, stir to dissolve. Remove from heat and let cool to room temperature. While milk mixture cools, beat eggs in a small mixing bowl and set aside. In a large mixing bowl, combine the cooled milk mixture with 2 cups of flour, then add eggs and yeast and stir until combined. Slowly additional flour and mix until the dough forms and pulls away from the side of the bowl. Generously sprinkle flour on countertop and turn-out dough to knead. Knead for 5 minutes adding flour to prevent dough from sticking to hands and the counter. Dough is ready when is springs back quickly if pressed with a floured finger. Turn out dough on flour-dusted counter and push out the air. Divide dough into 16 equal portions, keeping dough covered with plastic. Roll each portion into a ball. Use flour prevent dough from sticking. Spray a cake pan and/or spring-fold pan with cooking spray. Place balls of dough in prepared pans with 1 to 2 inches of separation. Cover pan with plastic wrap and let rise until doubled, about 1 hour. Preheat the oven to 375°F. 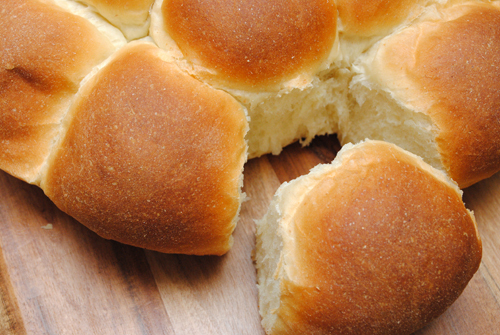 Bake rolls for 20 to 22 minutes, or until bread is golden brown. Internal temperature should be 190°F when done. 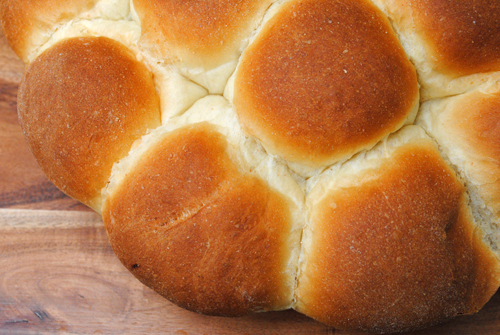 Let rolls cool slightly and serve warm.